Faller Bars for Jute /Flax , Sisal or Hemp machineries can be manufactured and supplied as per standard or special specifications. The basic materials of bar body are of international standard and ends ( both for rectangular or round types) carry adequate hardness to render high quality and working life. We take special care for pins alignment and pin projection & pin density etc. We are one of the prominent names, engaged in manufacturing and supplying fast section faller bar complete assy. These are manufactured in CNC machines. These are manufactured by our highly professionals. Which makes it's superior quality. 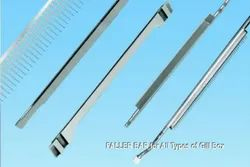 We are agents for complete range of Faller Bars i.e. Faller Body progressively manufactured by our Principals M/s. Officine Coppa SRL, Italy for all makes and types of machines. 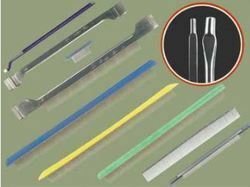 We are manufacturing wide range of Disposable Faller Bars.